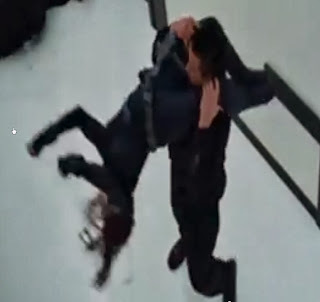 A while back I promised to go through the fight scene between Natasha Romanov (Black Widow) and a small army of mook guards from Iron Man 2, using Technical Grappling. Not a bad topic for my 200th post since Dec 26, 2012! The key fight takes place in about a minute, from roughly 0:20 in the clip until Lady Scarlett finishes off the last mook at 1:22. Here’s how I break down the action, with my initial impressions of what happens. I will break down the bits into scenes, each described in detail later on. Those sections are referenced in bold. While suggestions are made for mechanics in my notes on the clip, I may revisit them in the details, so withhold judgement until the end! 0:31 – Happy’s guard gets tired of getting hit, and starts to fight back. A lot. 0:50 – Happy is experiencing the NPC version of grab and smash. He’s not Happy anymore. What follows here is the clear “holy crap!” moment of the scene, as she takes on and defeats three foes at once. 0:59. She readies a garotte. She strolls away, and another guard is maced in the face, caught by surprise, at 1:22. 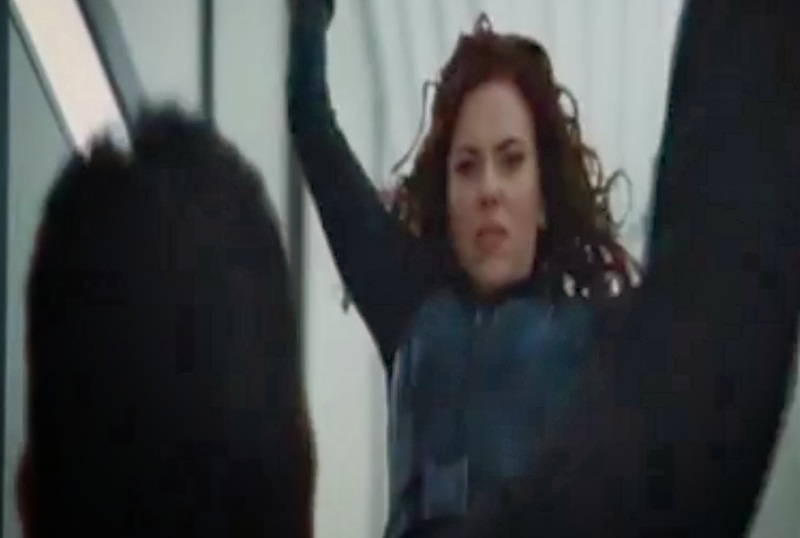 Natasha Romanoff is no mere normal. She’s a recipient of the Russian version of the Super Soldier Serum according to this link in Wiki, and the writeup simply screams “really high stats” to me. She probably has DX on the order of 18-20, maybe more. She’s probably been trained to DX+7 or DX+10 in several styles of martial arts. As is typical for comic books, the power list is mixed, but generally agree that she probably has Enhanced Time Sense, definitely Combat Reflexes if not ETS, and her DX, IQ, and HT are all very high. Not entirely sure about ST, but I need to put something down. On the low end, she’s about 125-lbs and a world-class gymnast and ballerina. Doing a bit of digging, it seems that female gymnasts can often throw down bench press on the order of 2x their (usually slight) body weight, and Natasha has all that Super Serum to think about. She could be anywhere from ST 13 to ST 16 without really blinking at it. Let’s call it ST 15 for now, and with that DX+10 Wrestling for +5 to Trained ST, she’s looking at Trained ST 20, DX 20, Wrestling-30. Not to mention buttloads of Judo, Karate, and Boxing. Her low mass (based on ST = HP = 2 * cube root of weight in lbs) is only the equivalent of ST 10, so Sumo would be a bad choice. She probably has high ranks in Brawling too. Definitely Trained by a Master, and possibly one or more specialties of WM, though with skills as high as hers, she won’t need it. Based on the number of moves she does in any given turn, it’s nearly certain she has at least one, if not two, Extra Attacks. The overall point here is that she was born in 1941, trained as a spy, sniper, and martial artist for 70+ years while remaining young, and weaned on Russian Super-Soldier formula. High stats and skills are what she does. That means she’s going to have the skill to do a lot of stuff in one turn if she wants, to the point that I probably won’t often note the final skills she’s rolling against. She’s that good. One last point to those who might object: even a DF character, such as a Knight or Martial Artist, can start the game with skills in the 18-20 range (higher if you go nuts). Natasha is more like a Monster Hunters 400-pointer, and by jiggering around with a Warrior template, you can easily put all sorts of hand-to-hand goodness in multiple skills into the DX+4 and DX+7 level. Just going to town on what she should have, she’s probably a 1,000-point character using Wildcard! skills to cover the breadth of her expertise. And that’s without giving her lots of 20s in stats. This one’s easy. She walks by the guard who is distracted by Happy starting his fistfight, and tosses two stunners which cause electromuscular disruption (High Tech, p. 89; p. B432). He fails one or both of the HT-5 rolls to resist and falls to the ground, paralyzed. She moves on. Natasha runs the prerequisite distance and does an Acrobatic Attack, using the Vaulting and Diving rules (Martial Arts, p. 107) to clear the low cart. This acrobatic double-leg grapple is something she uses two or three times in this fight sequence alone, so we’ll build it as a Technique that ignores the skill cap of 9. She’ll roll Acrobatics-2 to clear that cart, and then a monster penalty to her grappling skill for an Acrobatic Attack (-6), that ignores the skill cap (-1), targets the neck with a grapple (-3) with the legs (-2), for a whopping Skill-12. I’m quite sure she’s not using this from default, but if she has Skill-26 she can pull this off 90% of the time even without buying it up. I won’t say she’s bought it up all the way to full skill, but even if she’s got it to Skill-6, she’ll be able to throw this with some major Deceptive Attack action attached. So we’ve identified an Acrobatic Double-Leg Grapple as one of her signature moves. 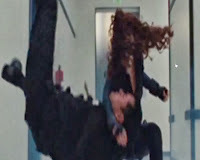 We can resolve the finishing move as a Judo Throw for injury (Martial Arts, p. 75), with Black Widow’s Judo vs. her foe’s ST 7, DX 5, or highest grappling skill, which is unlikely more than 9. She need not even spend CP. She’ll roll at Judo-8 for the attack (targeting the skull, at -1 for a damage throw), but since she’s adding her weight to the throw and landing crawling, picks up an extra +2. She definitely does all of this stuff in one move, so she’s Rapid Striking for -6 to both as well. Net: Acrobatics roll at -2 to clear the cart (the easiest part of all this); Acrobatic Double-Leg Neck Grapple at -6 beyond whatever her skill is for Rapid Strike, and a Judo Throw for injury at Judo-12 to combine the weight change, Judo throw to the skull, and rapid strike. Now, it’s possible that the takedown is a variant on a Grab and Smash, but canonically, this can’t be done on a standing foe by smashing their head to the ground. Still, what it would be if you wanted to do it this way is a Force Posture Change (-4 for taking him down, +2 for landing crawling, net of -2) to get him down combined with an attack to the skull at full penalties. That’s DX, Brawling, or Wrestling as the base, -7 for targeting the skull. You’l do thrust crush damage plus whatever CP you choose to spend (!!) to the skull. Note that this two-move combo is also a Rapid Strike. If Black Widow has Extra Attack (one or more), this would take some of the gigantic penalties accrued and limit them. She probably has at least that, and so between a Rapid Strike, Extra Attack, and maybe even an All-Out Attack (Double), she can probably spread all of this stuff over one turn fairly easily. Note also that in many of these moves, she ends not grappling the guy at all, meaning that somewhere along the line she spent all of her usually-massive tally of CP to really make these guys look like idiots, or perhaps add injury to the throws, or lower the location penalty of striking the skull from the throw. Probably that last one. I’ll call this one an interesting combination of Evade (p. B368) to move through his hex, paired with a Pressure Points strike to the lower leg, total of Karate-4, then a Pressure Points vs. HT roll. The Evade vs. a standing foe is at -5. 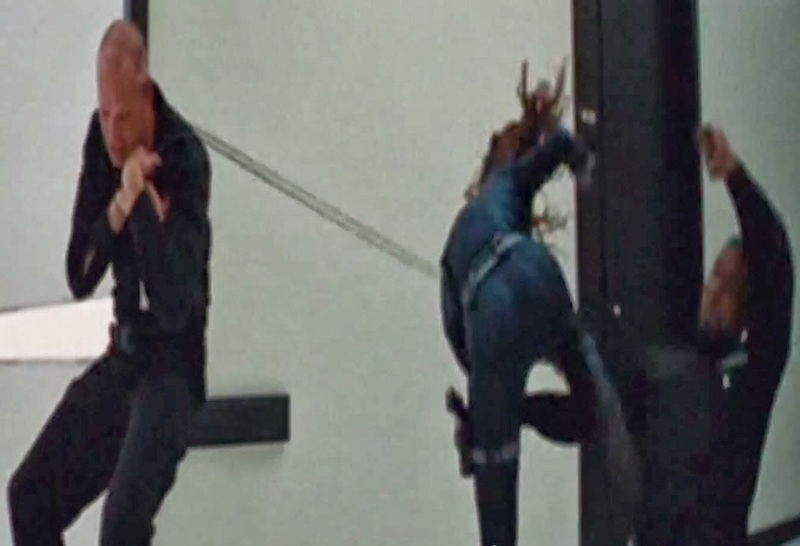 The fact that the guy is still there a few seconds later for Black Widow to use the same Acrobatic Attack as the previous fight means she applied lasting crippling pain. Already handled by the GURPS rules, so go +Sean Punch and +Peter V. Dell’Orto! This quick scene is a near-mimic of the previous one. She uses her Acrobatic Double-Leg Neck Grapple again, this time over two turns – there’s a notable break between the grapple and the takedown. So first turn is the vault over the guy and the grapple; the second turn is the leg-based offensive Judo Throw, this time landing standing, and using the CP spend to cancel out the penalties for the skull location. After tossing a few flash-bang/smoke grenades to render both foes stunned (like she needs that, but “fight fair” is an oxymoron), she does a sweeping kick to the first guy’s leg. She also spends a few points to cause him to crit fail his defense roll, where he knocks himself out. This is part and parcel of treating mooks as scenery, from Impulse Buys, p. 6 – and is especially appropriate for this sort of fight. She then dispatches the other guard with a kick to the face, and I’d call the “I walk up the guy’s leg” simply an application of Deceptive Attack. She’s doing something like 1d+3 damage with that kick, enough for a Major Wound to the Face, inducing an HT-5 roll to the mook, who has about a 85% chance of failing. Which he does. The most exciting part of the fight, and the most complicated to adjudicate. Also with weapons! First, Natasha readies her handy-dandy extendable garotte using a Defensive Grip. It’s a flexible melee weapon (see TG, p. 14-15) with the neat trick of being extensible, and can grapple at a reach limited by its length (or more properly, half its length). The first guy does a classic overhand attack to the head. Natasha uses the garotte to do a Grabbing Parry. She’s +1 for the Defensive Grip, using Judo – and so can parry unpenalized vs. armed attackers, but still accepting -4 to parry the limbs of an attacker with a Reach 1 weapon. She also slips into close combat using Judo while she does this, for a net +1. So, all in all, she’s parrying at -4, not bad, really. In a realistic game, the fact that she’s parrying a swung weapon with Judo would make her Parry at -7. When she makes her parry, she inflicts CP based on half her ST (call it ST 7), and we’ll slap on the bonus for +1 per die for the flexible weapon, so she’s at 1d-2 CP for the parry . . . but doubled because of the cinematic switch. That is 2d-4, so an upper bound of 8 CP, and an expectation of about 3 CP. Relative to Natasha’s other stuff, this isn’t a lot. She knows this. She seems to use something like Pass Limb (or hell, maybe just a DX roll) to transfer both ends of the garotte to her left hand, releasing her right. It’s hard to tell without frame-by-frame, but it’s also possible she’s just using the weapon in a Defensive Grip while slipping in for the parry using Judo. That’s a net of Parry+2 using the normal rules. She then does a three-move kick to the knee, punch to the face, and punch to the chest, possibly a Pressure Points strike (TG, p. 33), since he spends his next turn suffering from enough pain that he just stands there. She reacquires her garotte, and grapples her paralyzed foe around the neck with it, this time using her best unarmed grappling skill, and likely doing something like 2d+3 (doubled!) control points. She dodges a Move and Attack punch from the second guard, and buys a critical success, forcing him to roll on the Unarmed Crit Miss table; he continues past her and falls down. She does a Grabbing Judo Parry against the punch from the third guard, scores a few CP, and then follows up with a really awesome move. She improves her grapple on the third guard’s arm, and does a Rapid Strike Judo Throw for injury on both of them. Both are offensive throws and Contests of Skill, so she spends CP liberally to make them go down, go down hard, and stay down. She can do both because she retained the grapple from the lanyard on the first guy, and has lots of CP from the arm grapple on the third. Ah, poor second guard. He fails to learn from the giant pile of unconscious buddies twitching around him. He Readies a can of mace while changing posture from prone to standing over the requisite two-second period. Really? A can of mace? How about an actual mace? Might at least have looked threatening. Instead, doing so, for all intents and purposes, seems to merely provoke what looks very much like an Attack of Opportunity. Actually, he probably does a Wait, and will spray her if she gets into range. She charges in anyway, triggering his Wait, and she slips inside using a grabbing parry of the torso. She persuades her GM that she should be able to use the stepping from a retreat as the movement that allows a Change Position maneuver (TG, p. 35) and accepts the -2 to her Grabbing Parry that getting into her foe’s side arc implies. On her own turn, she completes her move by doing another Acrobatic Double-Leg Neck Grapple, also accepting -4 to slip from the side to the rear arc. She probably does enough CP (2d doubled) that poor slow learner’s turn is spent going “Wha? How? Who? Ow!” due to the active control penalties alone. Her next turn, she attacks with her arms and releases her legs, and then does another Judo Throw for injury, putting this guy out. Move and Attack must be part of this private security company’s standard training protocol, because here comes another one. At least this guy had his weapon out first. To no avail. Natasha does a classic grabbing parry, followed immediately by an Arm Lock roll while acquiring the weak side arc of her foe. Note that the extended arm bar and flipping up into the standing shoulder lock are probably not two moves, though it could be modeled as increasing the CP on an already-locked joint, but more importantly, applying pain. She spends enough CP on that arm lock to reduce the guard’s Grip CP to zero and grabs the can of mace herself. A spinning elbow to the face stuns him, and a spinning kick to the skull finishes him off. This fight was a classic one-on-many fight where the heroine makes otherwise competent individuals look silly by dint of sheer awesomeness. The double-the-CP switch does this, making grapples almost comically effective. The cinematic tendency of the mooks to Just Stand There while the heroine goes to town on them is probably best represented by the huge CP totals making die rolls nearly pointless – from the viewer’s angle, “he just stood there,” but game mechanically, he probably tried to do something and failed. 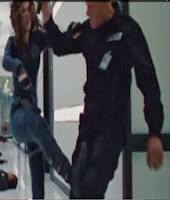 The only thing I wonder about is that most of Black Widow’s takedowns – all but the last one where she switches arms for legs so she can land kneeling – look more like Force Posture Changes plus Kiss The Floor to me than Judo Throw. But the fact that every one of these is basically an FPC for injury, requiring a Rapid Strike, while Judo allows this in one move with an offensive throw for injury, makes me think this is the right call. Judo is, after all, a Hard skill, and being able to do this is appropriate. I hope this breakdown, even though I didn’t have a full character sheet and numbers for Natasha and all the mooks, helps show how you’d do TG in a cinematic beat-down. Thanks to Marvel for making this HD-quality clip available on YouTube. All images are Copyright to them, and used with the intent to show how awesome their movie, the character, and possibly my book are. Two of those things are likely cooler than the other. Awesome breakdown of a very cool scene! Another way to build her is to look at GURPS Supers and its Sifu template – a mere 500 point one with DX 17 and Fist!-20, and of course TBAM and ETS. A single pumped up wildcard skill would cover all grappling moves, and with 2xCP, it'll get silly fast. Nevermind Black Widow is beyond a "beginning" martial arts hero, and certainly has a higher skill. Yeah, that sounds really interesting, and appropriate. I'll have to reread how Wildcards and Techniques combine – for example, the Acrobatic Double-Leg Neck Grapple . . . I presume one doesn't roll with such mongo penalties as I listed? Just roll once for Acrobatics, and then maybe Fist!-5 to grapple the neck with both legs? If she had a Wildcard style such as Sambo! or Taijitsu!, she'd get all the style's techniques at full skill or skill +3, as appropriate. For something like Fist! or Modern Ninja!, she'd have to buy the techniques normally, but a signature technique or two isn't that expensive on a 750 or 1000 point budget, and a lot of the cost goes down if she has Extra Attack 2. I think eyeballing her at ST15, DX18, HT14, TbAM, Combat Reflexes, Extra Attack 2, and Modern Ninja!-25 or so with a couple of techniques like Flying Acrobatic Double-Leg Neck Grapple (FADLNG) and Lower Body Head Lock. Her signature attack could be a Move and Attack for the FADLNG, followed by the Head Lock, followed by either a throw from the lock or just a standard judo throw for damage (as you note, she's at a 17 for the damaging throw to the skull and probably has enough CP sitting around to buy off the penalty if she wants to make it hugely deceptive). I think those observations are well-made. The Style! skill would really be the best, and with the right choice of Style!, we can likely pull in all of the primary skills she's likely to need. The Extra Attack 2, in retrospect, is really key, since she so often strings so many disparate moves together, and she's not acting like she's taking -12 in Rapid Strike penalties (4 x -3). While Mark is technically correct, in Supers it's perfectly reasonable to say that wildcards contain all techniques in the same way styles do. This is especially reasonable if martial artists are differentiated by powers and costume and gadgets, not by martial arts styles per se. Extra Attack is always reasonable for supers, and it really does make a huge difference – you've seen Chuck Morris mopping up fodder with Judo in my DF game . . . Extra Attack turns multi-turn or multi-strike offense into a single-turn defeat. Oh, yeah. Sambo! as a style Wildcard is exactly what's called for. It's even Russian. I think the Puny God scene, ironically, is easy as an Offensive Judo Throw for injury, but really needs its own mechanic based on DX or Brawling. 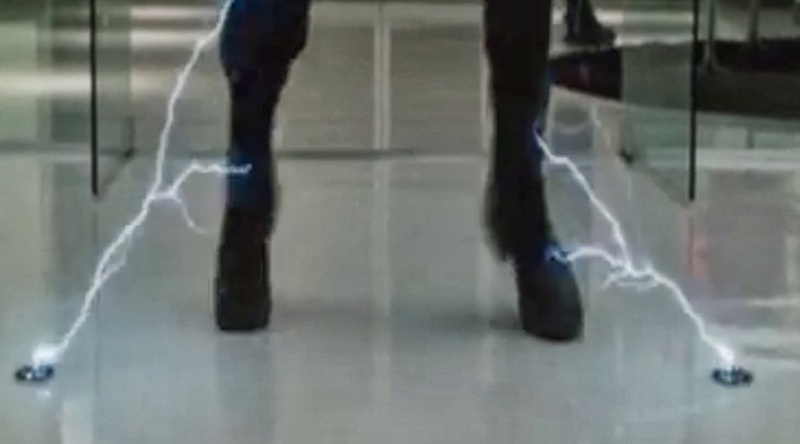 I wonder if what you do there is to treat Loki as an improvised weapon, strike the ground for damage, but apply that damage to Loki AND the ground rather than just the ground. With the BW vs. Hawkeye fight . . .interesting. That one and the one that led off the Avengers in the Russian factory are both prime candidates for translation. I think the Bourne vs. Castel fight (http://youtu.be/UFnmq5PPScA) would be great to do as well, since you have two closely matched opponents (though Bourne is still clearly better), and you get some failed rolls (Bourne unable to initially disarm the knife while having Castel in a shoulder lock). 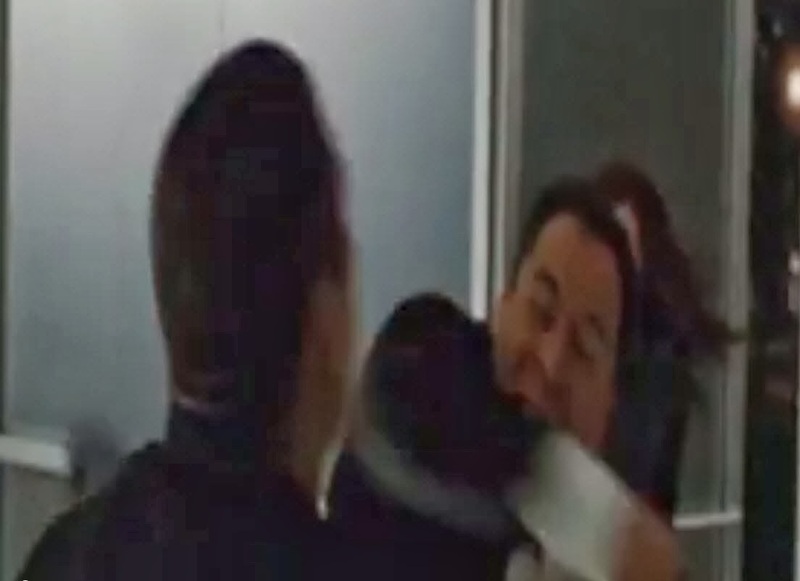 Also, the Embassy fight scene (http://youtu.be/JmxK_pBaG4E) would be another. Those fights are still cinematic, but much closer to plausible than the Black Widow fights. I know this is a super old post, but it remained me of something I was going to ask on the forums, but would really prefer from the horse’s mouth. If you want a character to be able to use ties, scarves or socks as grappling aids, do you need the Garrote skill to be able to Armed Grapple with an improvised garrote or are you allowed to use your Judo or Wrestling skill with the grappling aid and still receive the bonus to CPs for using a flexible weapon? You can do either one. If you use Armed Grapple with garrote, you can use any and all of the special features of the weapon (which, um, there aren’t any). If you simply use Judo and Wrestling, you get the control point bonus due to leveraging a flexible weapon.